Plastic is endlessly useful. It has spurred economic and technological growth and made life in many places easier. But it presents us with an ever-growing existential threat: It’s a petrochemical product, made from dwindling natural resources. And the mounting accumulation of plastic waste is poisoning our seas and our food chains. It would be easy for a plastics show to be simply ominous. But there’s also much to marvel at, and some pieces play it both ways. In the archive section, the escalation of plastic production is made scarily concrete. Pam Longobardi’s 17-foot-long “Economies of Scale” starts with a tiny pellet. Dozens of figurines, vessels, and more get progressively larger, ending with an ample fishing buoy. Their shadows get longer and longer, a visual representation of threat. On the other hand, there’s the appeal of bright, malleable materials. The works with the most razzmatazz come in the section focused on the present. Aurora Robson recovers trash and turns it into funky sculptures, including two here named after her daughters, Ona and Isla. Each is just figurative enough — bell-shaped, and topped with a circle for a head — to suggest personality, one in wispy, translucent sapphire and the other in fizzy lavender. 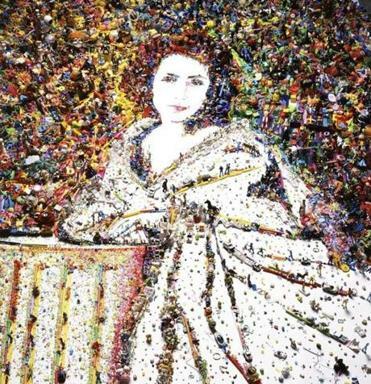 Vik Muniz’s “Sarah Bernhardt” operates on both circuits, entrancing and sobering. The artist rendered the celebrated actress in an assemblage of thousands of plastic toys, and photographed that to echo an 1864 portrait by photographer Félix Nadar. Beads and soldiers, dominoes and tiny cars, all play out tiny dramas. At the center, a horseman with a scimitar confronts a Smurf bearing a gift. Yet all the brightly hued toys cohere into the classic, smiling image of Bernhardt, reminding us how easy it is to lose sight of the increments of environmental destruction in the face of charm and artifice. Some pieces are piercing in their despair. Chris Jordan, a warrior against plastics, is best known for photographs of decomposing albatross chicks, starved after their bellies filled with indigestible detritus. His video, “Camel Gastrolith,” spotlights the plastic amalgam excavated from the stomach of an Arabian Desert camel, who, like the chicks, died when it could not digest the trash it had eaten. By the time I reached the future-themed artwork, I was expecting miserable dystopias and wastelands. But “Plastic Entanglements” ends on a positive note. Pieces here encourage us to grapple with what this material means to us. Tejal Shah’s captivating video “Landfill Dance” doesn’t turn away from the wretched mountains of trash growing in her native India, but it inflects one such site with grace and compassion by way of seven dancers in white costumes and gas masks. Their performance hallows a place we’d rather avoid. We can’t just give plastic up. Shah and other artists looking to the future in “Plastic Entanglements” have no answers, but they shift the conversation. That may be a beginning. “Konstantin Simun: The Sacred in the Profane” at the Museum of Russian Icons in Clinton (in partnership with the Fitchburg Art Museum) takes a similar tack. Simun, now in his 80s, came of age in the Soviet Union, a nation that did not share America’s heady romance with plastic packaging. Simun moved to Boston in 1988, and the plastic refuse grabbed his eye. He saw faces in detergent bottles. His works are a peculiar, vibrant extension of the aesthetic threads informing his artistic heritage: the readymades of Dada, the sleek, imposing forms of Russian constructivism, and the deep faith and frank figuration of Russian icon paintings. Overturn a plastic jug. It becomes an expansive head, its handle a nose. Cut the handle at the bottom, and you have a small mouth. Simun elaborates from there: His “First Lady” (a religious reference, not a political one) is translucent white, housed in a glass cylinder that casts halos of light and shadow around the form, making it luminous. The bronze cast “Scream (Self-Portrait)” is made from two gasoline containers, each with three sections. One, the head, perches catty corner on the other, the shoulders. Simun has cut open the bottom section of the head, making a wailing mouth with an open door. A weathered green patina covers the outside, but look down the gullet of this figure and it’s polished bronze, reflecting the light, suggesting an inner glow. Simun reclaims plastic for sacred purposes. Like Shah, he finds the holy in what we habitually discard, and challenges us to do the same. That would be necessary and healing work, and perhaps a route out of the trash heap we find ourselves in.